Currently beads are thought of as adornments but if you look back to the ancient times they were symbolic for different things. Apart from making jewelry, beads in Africa were used on alter Mantles, apparel for Royal statutes and on stools. In Philippines two beads are placed in a cup during wedding ceremonies to bind the marriage. Beads have often been viewed as symbolic for curative powers, served as a passage to the afterlife, to conduct rituals and prayer. Beads are used to communicate ones status in the community. Beads have served as the medium of exchange in trade hence the name Trade beads. Europeans exchanged beads for Indonesia spices, gold, ivory and Slaves from Africa. I chose to narrow in on beads popularly sourced from Africa which found their way through trade or the know-how of making them has been passed on through generations. The Pokot community makes and adorn themselves with layers of wooden beads to signify their marital status. Metallic beads are made from disposed off pans. Glass beads continue to be made from recycled glass or imported glass as their raw material. Bead-making in Sub-saharan Africa has remained intact amongst the Bida of Nigeria and Krobo of Ghana. Bodom glass powder beads are considered to have medicinal and magical powers. These beads are created by the Krobo people and are sometimes referred to as Krobo beads. They are mostly yellow in color. A number of Venetian, Dutch and Bohemian beads made their way to Africa through barter trade. We have “Milliefiori” beads from Italy used to make beautiful African jewelry. Mali wedding beads were given as a gift to a new bride hence they were considered to be special and intimate beads. The Agate stones when adorned were associated with royalty. Islamic beads that have a star on them are considered to be good luck charms. Bronze beads were created for the ordinary people and Gold for the royal households. The Baoule of Ivory Coast and Asante of Ghana shared a common culture of being gold smiths. 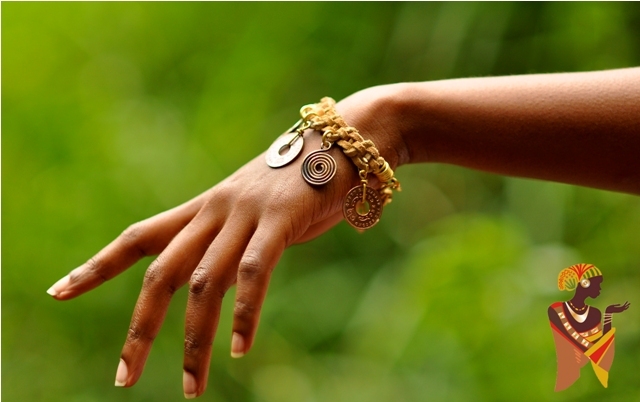 These bronze beads add a special sparkle to Afro-centric jewellery. These are collectibles; these coins were used in the colonial period as medium of exchange. They were popular known as ‘Kaluwela” made from copper material. Before the onset of coins Cowrie shells were used as legal tender. Currently the same are used to bead on garments and make jewelry. I am very passionate about Art and especially the art of making jewelry. As I design jewelry I take into account the beads I will use to depict the concept i visualized. Each bead I use tells of a culture whether political, social or religious. 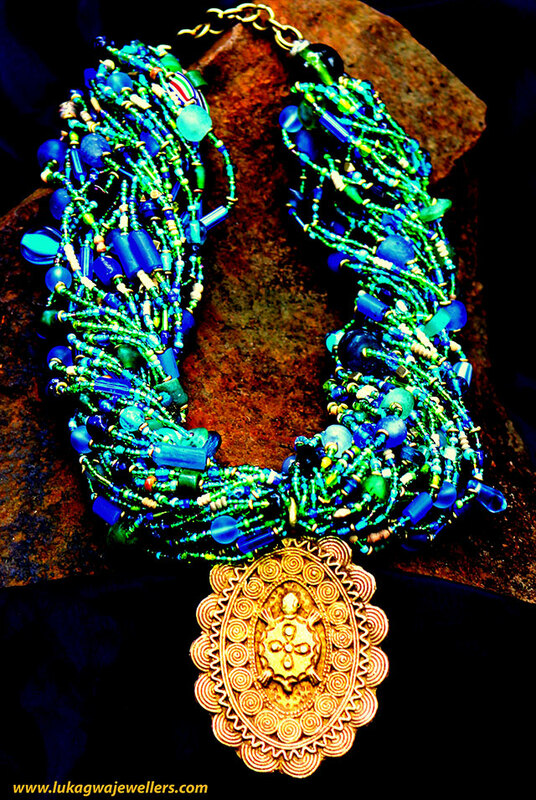 These are the images of Afro centric jewelry that has encompassed these beads.